Free p&p on all orders with this product. A CPR provides key information that a nurse will require on placement and in practice, selected by experienced teachers/practitioners, clearly written and presented, drawn from a wide range of different sources, packaged in an easily accessible portable format suitable for pocket or mobile phone, invaluable for all those involved in the first five years of nursing, from the clinical skills lab to preceptorship. Nursing students, mentors, practice educators and preceptees will find that this resource enables the move into real life practice, supporting safe, confident patient centred nursing. Extended assessment section including latest assessment of risk tools: A to E, NEWS, S BAR; plus Glasgow Coma Scale, respiratory tables, shock and sepsis, and wound healing and other topics. Latest teaching trends and national drivers such as NICE and Essence of Care, are reflected to provide coverage of the widening range of competencies a nurse needs to display in today’s healthcare environment including the (DOH) 6 Cs – Care, Compassion, Communication, Competence, Courage, Commitment and a ‘Person Centred Nursing Framework’. This resource provides rapid access to key information that a nurse will need to provide effective holistic care of the adult patient. For the student on clinical placement it provides a valuable aide memoire for recently learnt key information. For the newly qualified nurse/practising nurse it assists review, reflection and revalidation. 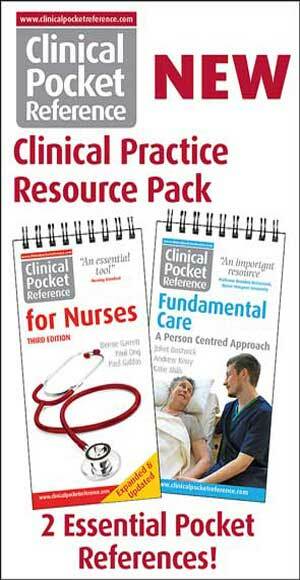 2 Essential Pocket References s/wrapped SAVING £3.00! Bernie Garrett, University of British Colombia, Vancouver, Canada; Paul Ong, Juliet Bostwick, Andrew Kerry and Katie Mills, Department of Clinical Health Care, Faculty of Health and Life Sciences, Oxford Brookes; Paul Galdas, University of York, York, UK.